The Rosetta spacecraft has taken hundreds of stunning photographs of Comet 67P/Churyumov-Gerasimenko over the past year, but a portion of the comet was obscured due to its odd seasonal shifts. Now, thanks to a special camera aboard Rosetta, scientists have created a sketch of its elusive dark side. Comet 67P/C-G’s double-lobed shape and rotational axis has given it a rather odd seasonal pattern over its 6.5 year-long orbit. Its northern hemisphere experiences a long summer that lasts 5.5 years, during which time the comet’s southern hemisphere undergoes a long, dark winter. But when the comet gets close to the Sun, i.e. the perihelion point, its southern hemisphere transitions to a brief—but hot—summer. The comet’s northern hemisphere was still experiencing its long summer when Rosetta arrived, making it difficult for its onboard cameras to take a picture. Without direct illumination from the Sun, the VIRTIS and OSIRIS cameras were of little help. But during the first several months of the encounter, the Microwave Instrument for Rosetta (MIRO) was able to scan the dark side. Sensors on this device can detect the amount and temperature of substances like water, ammonia, and carbon dioxide via their microwave emissions. 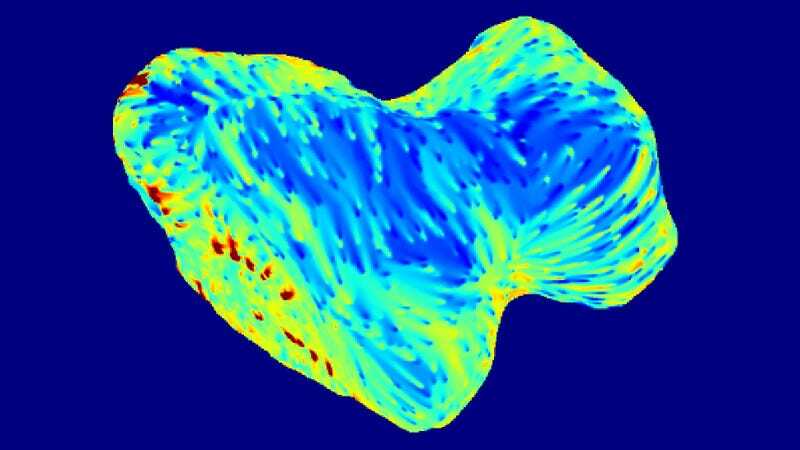 MIRO allowed NASA scientists to measure the chemical components of the comet’s dark side and paint a topographical picture. The difference between the surface and subsurface composition of this part of the nucleus and that found elsewhere might originate in the comet’s peculiar cycle of seasons. One of the possible explanations is that water and other gases that were released during the comet’s previous perihelion, when the southern hemisphere was the most illuminated portion of the nucleus. The water condensed again and precipitated on the surface after the season changed and the southern hemisphere plunged again into its long and cold winter. The results are only preliminary. The scientists say they plan on revisiting the MIRO data using an updated version of the model.